Seattle Opera’s production is a perfect blend of talent, from the majestic voices to the versatile conductor to the sets to the costumes, writes reviewer Melinda Bargreen. First, you start with a world-class conductor. Gary Thor Wedow, a Seattle Opera favorite, fills that bill nicely. By George Frideric Handel, with Tomer Zvulun directing, and Gary Thor Wedow, conducting, through March 7, McCaw Hall, Seattle; tickets from $25 (206-389-7676 or seattleopera.org). That would be Stephanie Blythe. 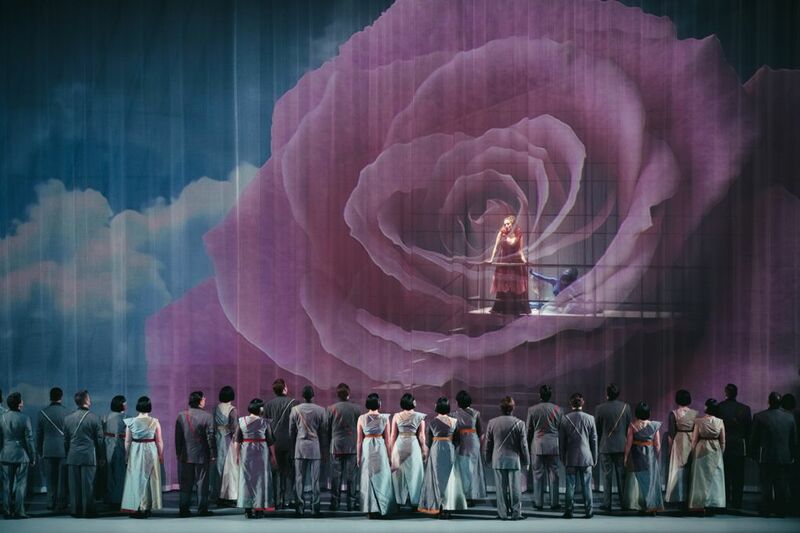 You also assemble a creative team to make “Semele” a marvel to look at: a stage director with a knack for action; set and lighting designers who make vividly imaginative use of projections, video and all sorts of special effects. Tomer Zvulun, Erhard Rom and Robert Wierzel, respectively. It doesn’t hurt to have a cast that’s easy on the eyes as well as on the ear: the lovely and stratospheric soprano Brenda Rae as the opening-night Semele, the ill-fated mortal who falls in love with a god. Or, more precisely, with a particularly well-nuanced Jupiter, sung by the handsome and artful Alek Shrader. Their counterparts in Sunday’s alternate cast, Mary Feminear and Theo Lebow, proved every bit their equal, displaying tonal beauty and vocal alacrity (Lebow’s virtuoso passagework was particularly commendable). Amanda Forsythe, the vocally and physically nimble soprano who sings the role of Iris in all performances, was great to watch as well as to hear. Blythe’s dual turn as Ino and Juno was so powerful and so artful that she made the term “commanding the stage” seem completely inadequate. Her voice is considerably larger and more opulent than you usually hear in Handelian opera, but Blythe sang with such fluent finesse that the score was well-served. Her second-act duet with Rae before a starry firmament was a production highlight. In Sunday’s cast, Deborah Nansteel was a worthy and impressive Ino/Juno. Like Theo Lebow, she is a former Seattle Opera Young Artist, a resounding recommendation for the revival of that program (now on temporary hiatus). Right from the start, this “Semele” gives notice that it’s not business as usual in the opera house: As the projected opening credits roll, you might be in a movie theater. The scenic elements offer gorgeous views of snowy mountains and revolving planets. The theatrical effects also owe much to Vita Tzykun’s imaginative costumes (Iris’ light-emitting outfit is among the most memorable), which make the show fun to watch, even if the chorus appears to have gone shopping in the “Star Trek” costume warehouse. A dazzling quintet of dancers is an integral part of the show’s action, with five of them leaping and twirling in Donald Byrd’s imaginative choreography. At times, they express the emotion of a given scene in joy or anguish; occasionally they function as décor (one dancer briefly serves as a table). Against the beautiful backgrounds, and with Wedow’s impassioned and adroitly paced conducting, the principal and supporting singers had every opportunity to shine. So did the chorus, well prepared by chorusmaster John Keene. Finally, kudos to the continuo, the small orchestral subgroup that accompanied some of the opera’s most intimately reflective moments: cellist Meeka Quan DiLorenzo, John Lenti (theorbo and guitar), Philip Kelsey (harpsichord and organ), and Wedow himself (playing the virginal, an early keyboard instrument). Melinda Bargreen also reviews concerts for 98.1 Classical KING FM and the American Record Guide. She can be reached at mbargreen@aol.com.